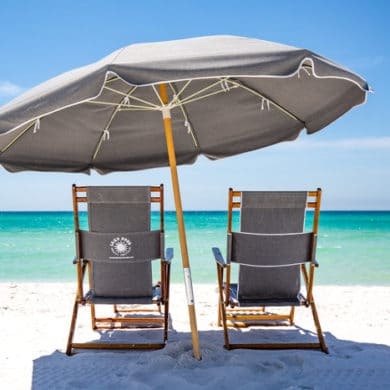 With more than 30 years of experience serving the Gulf Coast area, Lazy Days Beach Rentals is the gold standard for beach rental services in Fort Walton Beach. Beach chairs and umbrellas can be heavy and awkward to carry to the beach. Lazy Days Beach Rentals takes the hassle out of your beach day. Since the Lazy Days chairs and umbrellas are already set up on the beach, renting is as easy as flagging down a Lazy Days attendant. If a normal sized paddleboard just isn’t cutting it, Lazy Days offers a 22-foot paddleboard for $50/hour. See how fast you and your friends can get this giant board moving! You and your family can rest easy knowing that all Lazy Days attendants are lifeguard certified and willing to help. Even though they are not lifeguards, Lazy Days attendants have never hesitated to jump in and aid a struggling swimmer. Ashley Curd, the manager at Lazy Days, claims that this is just part of Lazy Days’ commitment to excellent service. As if that wasn’t enough, Lazy Days is always looking for new services to offer guests. A beachside bonfire is the newest Lazy Days offering. For $250, 8 to 16 of your closest family and friends will be set up with chairs, a fire that is replenished every hour, s’mores ingredients and sticks, a giant cooler with ice and tiki torches. Let Lazy Days make your next beach trip effortless. Lazy Days Beach Rentals is located at 1110 Santa Rosa Boulevard in Fort Walton Beach FL. For more information, visit the Lazy Days website or call (850) 698-0928.